EXTREMELY RARE PAIR OF PHOTOS -- Nearly impossible to find elsewhere. 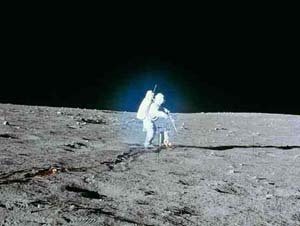 The following two photographs were taken during the 1969 Apollo 12 lunar mission, and were the subject of a great amount of interest and speculation at the time. These are the original NASA photos, without any "doctoring" or changes being made. What you see here is exactly what was registered on the camera film at the time, except these are low-resolution copies made for internet display. The photos you will get are high-resolution prints on good quality photographic paper, borderless, with a matte finish. The top photo appeared on the cover of Life Magazine on 12 Dec. 1969. The bottom photo has never-before been made available to the public. The photos are high resolution, better than anything previously made available to the public, showing excellent detail and are suitable for framing. An historical and scientific discussion of the photos is given on the weblink below. IN SOME PLACES, THE BLUE COLOR IS DELIBERATELY ERASED!!! Time-Life Corporation, for example, is selling reprints of old back issues of Life Magazine. 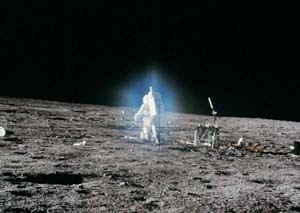 This includes the 12 December 1969 issue with the blue-glowing astronaut on the cover. Here on the left you can see the original Life Magazine with the blue-glowing astronaut on the cover. However, on their internet site, Time-Life is selling this same back-issue, and they advertise it with the blue aura around the astronaut fully deleted! They photoshopped the image to erase the blue color! You can check this out for yourself, by clicking here. 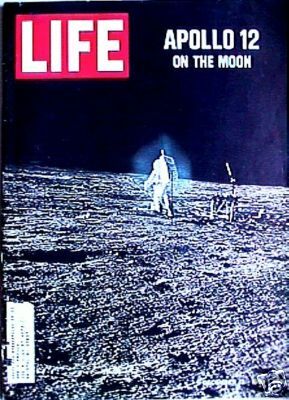 Time-Life sells a picture-framed copy of the same back-issue cover images, which also has erased the blue glow around the astronaut, available from here (for a mere $80 to $110). Why this is, we cannot say, but we do know that Time Magazine has, in the past, been terribly malicious towards new and unorthodox scientific findings, making Lysenkoist-Stalinist attacks against pioneers like Immanuel Velikovsky and Wilhelm Reich. (See the article by J. Wilder in Pulse #5, Heretic's Notebook, for example.) The blue color appears to be a scientific anomaly which orthodox science cannot easily explain. It is not some "film artifact" either, as it appears on two of the Apollo 12 images, and also on a lunar-rover movie from a later Apollo mission. Some said this was "lunar dust" or "water vapor", or a "dust smudge" on the camera lens. 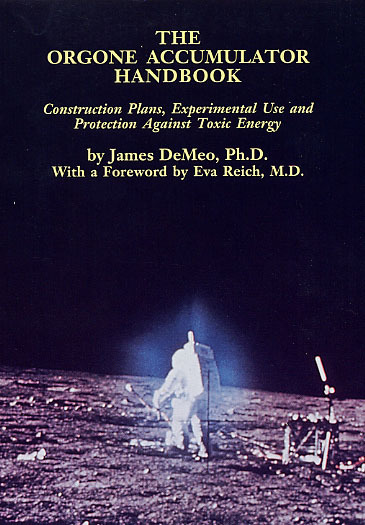 One scientist, Dr. James DeMeo, says it is like a "plasma discharge" or "Kirlian photography" effect, where the radiofrequencies in the astronaut's radio communications device excites the human orgone life-energy field while they are standing in the vacuum of space, causing the energy-field to luminate with a blue glow, much like one sees in high-vacuum tubes, or with the aurora. You can decide for yourself, but the photos presented here are the original and authentic ones! Click here for a copy of Dr. DeMeo's book on the life-energy question, which got this whole discussion going some years ago.